1. I blogged everyday this week...I am impressed with myself. Now that Presley has somewhat of a bedtime I can actually do things again! So blogging and reading blogs has slowly started to go back to normal. Although I still allow myself to soak up those moments when she decides to fall asleep on me instead. 2. It cracks me up that a popular way people find my blog is by typing in "Brandon Crawford Wife" all because of this post. Not only do I show up, but the photo is on the first page! Too funny! Let's Go Giants!! 3. I am really into baby wearing as it seems the easiest way to calm Presley rather quickly. I just ordered a Solly Baby Wrap after hearing so many bloggers loving on it. If you read yesterday's post you know it took me about an hour to decide on a color. I went with ox blood for the fall and I am pretty excited to get it in the mail! 4. If you follow me on Instagram you know my favorite thing to post is Presley and Finn photos. I seriously can't get enough of them. Honestly I have never loved him more, he is the best dog ever. 5. LET'S GO GIANTS!! WORLD SERIES 2014!! Happy to be back joining the gals of Five on Friday! Have a great weekend everyone! Oh my goodness, those pics of Presley and Finn together are just too sweet! They are going to be such great pals :) Happy Friday! You could make the sweetest baby book out of all Finn and Presley photos, I just love them! I hope my doggy is so sweet when I have a baby, he's a bit of a wild man though. I am so amazed with how much Finn loves Harper - I mean I knew dogs could sense these things, but he is just amazing with her!! I think I am as obsessed with the P and Finn photos as you are! SO cute, keep 'em coming! and GO GIANTS! That game, omg I fell in love with that team all over again! So pumped for the World Series! Um, I want the leggings that you're wearing in that first picture. So cute! 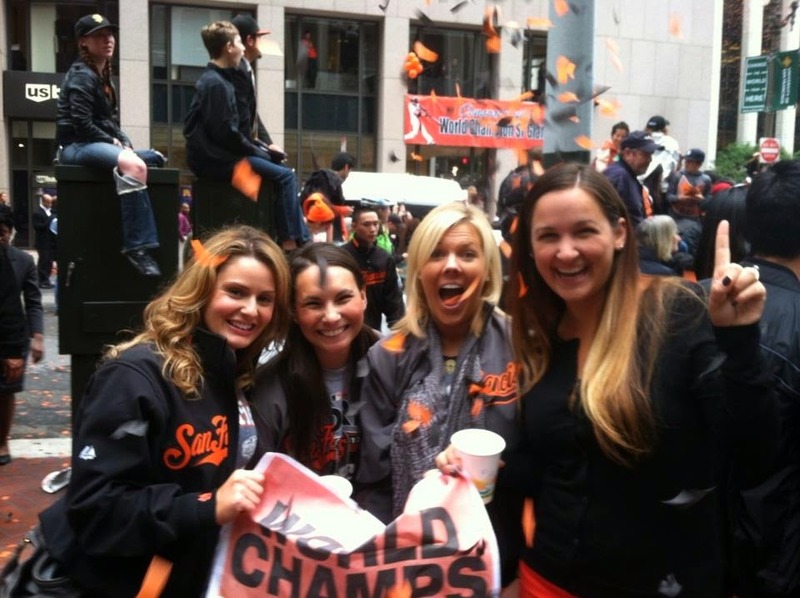 And I'm allll about the Giants winning the World Series!!! I love all of the Finn and Presley pictures on Instagram. They’re the sweetest! 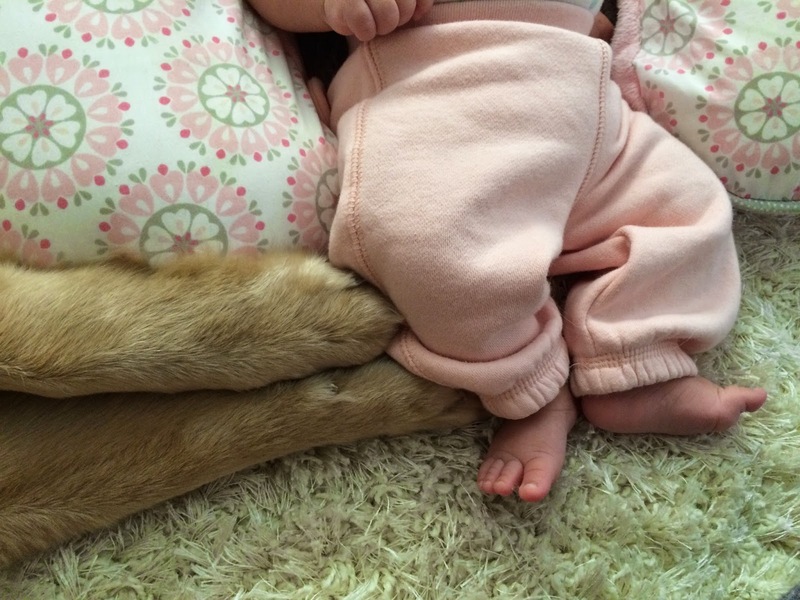 Any baby and dog picture makes me smile!! So adorable! 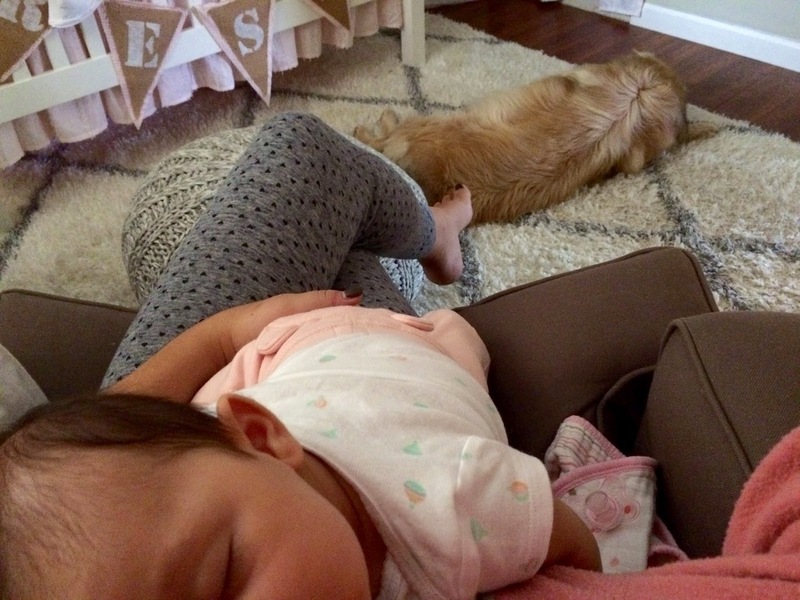 Just came over via April's blog...love those cute little toes! Baby snuggles are the best! Presley is such a doll, and love those leggings!! My favorite thing would be to post pics of those two too! Adorable!